Nashvegas doesn’t get its nickname for nothing. 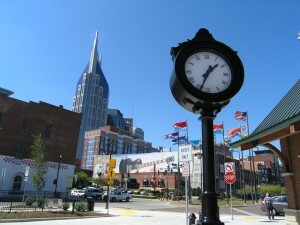 If you’ve ever driven down Broadway after dark, you’ll proudly recognize the sea of neon as the city’s one-stop-shop for honky tonks, boot shops, and all things “country music.” While tourists tend to flock to the lights like bugs in summer, Nashville’s downtown offers even more for its residents. Some of the city’s finest dining, museums, and of course, best music can be found just nestled amongst the high rises and condos in Nashville’s thriving center. Downtown living certainly isn’t for everyone. Homes are mostly historic condos with little room to move and prices are certainly higher per square foot, but if sparkling skyline views and a short commute to work are high on your list, looking at a space downtown should be priority. Nashvegas doesn’t get its nickname for nothing. If you’ve ever driven down Broadway after dark, you’ll proudly recognize the sea of neon as the city’s one-stop-shop for honky tonks, boot shops, and all things “country music.” While tourists tend to flock to the lights like bugs in summer, Nashville’s downtown offers even more for its residents. Some of the city’s finest dining, museums, and of course, best music can be found just nestled amongst the high rises and condos in Nashville’s thriving center. Downtown living certainly isn’t for everyone. Homes are mostly historic condos with little room to move and prices are certainly higher per square foot, but if sparkling skyline views and a short commute to work are high on your list, looking at a space downtown should be priority.